Service was quick, clean, courteously performed and fairly priced. The technician was friendly and explained everything in detail, offering lower priced alternatives. He spoke in a calm manner and at no time became frustrated. I take all of our vehicles to Valvoline - I like the personal contact and seeing (most) everything that is happening. Excellent, knowledgeable and kind technicians!! In and out fast. Everyone is so nice. Extra services were not expensive at all. Great place! We were in and out very quickly. Service was quick and staff was friendly. I would give a highly satisfied rating for someone if they went above and beyond. They did their job the way they’re supposed to. No extra credit for that. Friendly, quick, detailed service and was a good price. Only waited less than 5 minutes in line and was done in less than 40 minutes total. Service tech went above and beyond and was very friendly. The whole process took over an hour. I waited outside in my car for over 30 minutes until someone came out. Once I pulled in to a service bay it took over 30 minutes for the oil change. The guy servicing my car disappeared for 10 minutes and came back chewing on something like he stepped away to eat. He also greeted me by calling me young man. I am 59 years old. That seemed very odd. Friendly and courteous staff. Knowledgeable on what to do for my air conditioner that isn't working correctly right now. I never feel like I’m being ripped off. Everyone is friendly. Very well organized. The service members were very helpful and explained clearly what I needed (air filter and serpentine belt) but didn't push. Let me decide. I decided to only do air filter at this time but they recommended to get the belt done before next big trip. It felt friendly and honest. Techs are always wonderful. Helpful but not pushy. Did the job done correctly, quickly, and were very friendly the whole time. All you can ask for. Did not have to wait as I arrived. Oil change was completed in about 15 minutes. Friendly employees. Everyone was pleasant and I enjoyed my experience at this location. Will be returning. Customer services was efficient, clearly communicated the needs of my car, and the service was expedient. The guys know me as I have been going to this specific station for years now. I like how they inform me what my Ford Escape needs at that time or soon...friendly folks...the only reason I waited was that they had not yet opened for business...I go early. The waiting area and restroom and window counters could use a good cleaning...I noticed that hadn't been done in a bit. I believe it was fast and the staff were highly informed and made sure I was satisfied. I have been coming to this location for over 15 years when it was perviously owned by Texco lube. As a Deaf individual it's hard to trust just anyone and all the staff at this location are very accommodating to my needs. Kevin the manager always see that I am understanding and shown information in regards to the care of my four vehicles via on compuer screen. Technician explained problem I was having. Gave me suggestions on how to fix. Very polite and courteous. Customer service was awesome and I love how you don’t even have to get out of your car . Very convenient and usually quick service, I had to wait about 20 minutes but it was worth it. once in they services my car and had me out in 20 minutes. I 'm very happy with the service I received. The most amazing thing is the concept of instant oil change ,where you don't have to drop your car and come back. The staff was very nice I was dealing with the assistance manager and he was right on top of everything he had me in and out of their right away. Staff is very friendly and knowledgable. I've been using Valvoline for 3-4 years. they are extremely informative and trust worthy. Highly satisfied is in my opinion an unrealistic expectation. Pleasant courteous service. The gentleman that did my oil change did not try to push anything additional services on me, with the exception of the air filter which I was sure needed to be changed. Service was quick and professional. I plan to return for future oil changes. Will (the assistant manager) was incredible. His costumer service was out of this world. I have been recommending them to everyone I know after my experience there. I would go back just to hang with will! It was Fast, Quick, and Easy. I have been coming to this location for years. I have never had a bad experience. Nobody else could take me for an oil change over a week period. I visited here, was taken in right away, and just taken care of overall. Pretty basic. Pull up and the guy tells me how long till I should be expecting to pull in the bay. Once in the bay the tech was great. Explained everything correctly and clearly. I was highly satisfied. I think I just hit satisfied. The team was great. They worked quickly and diligently. All was explained, prompt courteous service, shop seemed orderly. I actually moved away from the town in which this Valvoline sits. I made it a point to drive up to this area to do my errands so I could visit this specific Valvoline location because I find them friendly, informative, energetic, and quick. The gentleman were polite, helpful no pressure and had my information. I visited previously. Plus as a Veteran I got my discount and great service. I'm a long time customer from it was Mobile, and now I'm with Valovline. I've never felt pressured bringing either of my 2 vehicles into the shop for an oil change. I'm not comfortable pulling into the bay, so someone pulls it in, and I wait in the waiting room, and everyone is very nice, and respectful. Keith answered all my questions, didn’t try and upsell me. The technicians worked quickly and efficiently. They explained what they were doing and I did not feel pressured to purchase any additional services. Had to wait a little which was okay. Service was fast and easy. Mechanic explained everything to me as they were doing it. Service was excellent! My Technician was outstanding and very knowledgeable and had a wonder personality. It was my pleasure to be served by her. I've been going to this location for as long as it's been there. I take all my work and personal vehicles there. Great people and great service. Mouse nest discovered by tech under the engine cover. He explained how to keep them out. I always use this site for oil changes and keeping my maintenance up to date. I like that my service records are visible to the tech and am advised when recommended service is approaching. I travel about 45 minutes to use this particular site! Everyone was very friendly and helpful. There was a long line of cars when I got there, but they kept the line moving. You provide a good service at a fair price. Please know that I pass 3 Jiffy Lubes to come to your Willow Grove store. Jiffy lube is CONSTANTLY trying to up sell and I stopped going for that reason. Your store is no pressure.....usually I just want a oil change in as little time as possible and all other stuff I do or take to my mechanic to do.Thanks for providing all of the above and see you on 3000 miles! It was fast, friendly, and I received what I wanted. I will be back! Quick service and no pressure to buy or upgrade anything. Your staff is so friendly and knowledgeable. I never feel pressured, but it is good to know what i need in the future. Thank you so much. Courtesy. Professional. Fast and well done.very satisfied. I was satisfied except for the wait. My agent was great. He was friendly, knowledgeable, and efficient. I appreciate the ease this service provides, I can sit in my car, ask and answer any questions immediately, pay the bill and drive away when completed. Always taken care of quickly and very happy with the knowledgeable and friendly staff. Always very courteous, professional and the way they check everything! It gives me a sense of security knowing they did their job correctly. Just a quick experience with very friendly service technicians. All appropriate customer service training items were on full display! Only reason my entire survey wasn't a "perfect score" was that, even after a $12 coupon, the price seemed a bit high. Good customer service. Vernon was great to deal with and courteous. Only negative was they ran out of stickers for the windshield. Minor detail but basic need of this business. Same main associate as last time. Friendly, quick, and informative. Friendly and efficient. Clear, direct communication about what to do. I liked the stay-in-car procedure and the interactive way in which I was guided to test my turn signal and lights. This way, the customer gets to observe how thoroughly the car is reviewed. You see fluids getting checked and topped; tires filled;pan dropped. I wasn't in a hurry,so time was not a factor, but I felt as if a lot was accomplished in a short amount of time. I trusted their findings for replacement ideas that could wait for another quarter. Prompt courteous service wins my business every time! The employees could have been a little more outgoing or helpful. Prompt service. The staff were more than friendly and professional. It was just an overall good experience. First time. Really knew nothing about it. I was well overdue for an oil change and have to make an urgent trip to Boston area in 3 days. It's a min 6 HR trip each way. I pulled in on a whim. One car waiting ahead of me. I had no idea what to expect. I'll be away for 2 weeks so my prepare time is short. I waited 8 min total! Amazing. The employees were terrific. Explained what was going on. No oversell just explanation. I got everything I needed (except the overdue inspection) to make me feel safe on my trip. In telling a friend about my experience she said their family brings their cars to the same place and they've been as satisfied as I was. Very kind and friendly! All staff seemed professional and worked hard. Everything was explained to me and any questions I had were answered. Will was mt service tech and was friendly and professional. I was rate my overall experience as a 5 out of 5. Services was very expedient. Mechanic was open with commmunicationnregarding what services were bring performed. The staff was experienced and extremely helpful. I loved that all my car's fluid were checked as well as the tire pressure. The fact that they replaced my windshield wipers with a pair I had in my trunk was awesome. Technicians Were professional and Efficient. They New they new what they were doing. I haven’t used this specific station multiple times now, the staff is very friendly and knowledgeable. I’ve been coming for some time now. I’ve even told family members and friends. This was my second visit. During the first one, I pulled right in and left about 10-15 minutes later. I was in a bit of a hurry for the second visit, and thought I could "squeeze it in" to my schedule based on the first visit. I had to wait about 10-15 minutes to get into the bay this time, so I was disappointed (but not necessarily reasonably). There were a least 5 cars waiting in line outside. Instead of taking the next car, when one bay emptied, they should have just taken the next car in and let the remainder of cars in line for the next opening. The guy at the available door took the first car and told the next 3 cars into the line outside each bay. I was the first car, but waitied longer than the other 2 cars to go in because the ones in the bays were quick and done before my car... not fair that I was first in line but waited the longest. I had another appointment that I was late for. I got exactly what I wanted. The change was quick. Outstanding professional and friendly service. Everyone does their job with precision and attention to detail. No up-sell pressure. Extremely efficient - in and out in 20 minutes. Highly recommended. Very happy with the service and the people who worked on my truck. They check my engine air filter, cabin air filter, signal light, headlights, transmission fluid & explain radiator cleanning, etc. Always great service and courtesy of the staff, very satisfied. The guy who assisted me was so helpful and only gave me what I needed and helped me with things I didn’t even realize I needed assistance with. The prices were fair. I am so happy. It was a busy, rainy Saturday, and the staff was working hard to get everyone in and handled. The safety checks were great, the staff was fast and efficient, and I did not feel any pressure to purchase any services I didn't need or want. I will be back!! The service is good. it is just that it is overpriced. On the previous oil change somewhere else I paid $54 for the full synthetic oil with the filter. At Valvoline I had to pay $62 for the conventional. The synthetic costs $81 w/o the filter. Why do you charge double? just for the customer not getting out of the car? I had to go back to get the warning light reset and had to get out of the car anyway. It was done outside and it was raining so I got wet. The staff was very thorough and explained everything well. I had used this facility in the past, and I had my daughter come with me in her own vehicle for her first oil change in her car. Craig explained everything. I mentioned a few things, which he said they would check, but did not pressure me into purchasing anything. My daughter was in the bay next to me, and her technician explained things to her and then came to me for decisions and payment. All in all, it was a good experience for me and my daughter. The guy I spoke to was very nice. He asked me my name and how I heard about them. i told him my co worker told me to check them out. He welcomed me. He explained what they do and asked me what kind of oil did I want in my car? He also told me they check other things and he would let me know if I needed any other services. The Gentleman who waived me in was ignorant andRude. The female African American girl was courteous and informative and the gentleman was very rude. Upon leaving when he waived me out the garage door he was right next to me I said have a nice day. He heard me and looked away . Very courteous and professional staff who performed promptly. They did not pressure for extra services, only notified of suggested services and finished in the time they said. Oil Change should not be so costly. Could not of been easier. Friendly and fast service. Will definitely return. The employee I had was friendly and didn't try to sell me anything that I didn't need. The workers are always polite and friendly. I really enjoy not having to get out of my car while it is being serviced. The wait time is never very long. Fast, Friendly, Knowledgeable service every time I go there. I have never been disappointed in any of my services. The service was fast and the staff was courteous. The cost was a little more then I expected but I was told that it was due to the type of oil that the car manufacturer recommended for the vehicle. This particular car has only had complimentary oil changes through the dealership before this oil change so I will look into the oil suggested before the next visit. The respect I’m shown by the agents and service techs can not be compared. When I’m here I don’t feel pressured into buying services that I don’t neccessarily need and they always do a thorough job inspecting/testing parts on my car that even the dealership fails to do. Other than waiting in line the service was great!! Service was quick and professional. Staff is knowledgeable, friendly and helpful. Carlos was friendly and helpful. He didn't try to push services or products that I didn't need. Everyone was very trustworthy. It was quick and the staff was very friendly, helpful and informed. I was just slightly taken back by price as it was quite a bit more expensive than my Penzoil drive through oil change. No particular reason. I got the level of service that I expected to get. The manager and mechanics were very professional and helpful. They were extremely busy yet they came out to my car while I was in line, checked me in. All around great service. I will definately recommend to others. Convenient, full checkup, good value. Friendly technician - TJ did an awesome job. Staff was courteous and friendly. Service was good. This is always a great experience for me, so much so that I actually look forward to my next oil change. The staff is always friendly and helpful. Will always takes good care of me, his honesty and professionalism keep me coming back. When he recommends a part be replaced, I agree without hesitation, because I know that I can trust him. Andrew was very diligent, he is a hard worker and efficient as well. Great customer service is rare these days, and it is what sets this place apart. Will is the tech that service my car. He is very professional and helpful. Such a friendly staff. Yes I waited a little bit but I was in no rush at all! Very very satisfied with how friendly everyone was! Customer service makes all the difference!!! The staff was very friendly and attentive and let me know everything that they were doing to my car. I was quoted a price for my services. When it was time to pay I gave a $15.00 coupon from on line. MY total became higher than was quoted. There were 2 extra charges I was NOT told about. I feel like I was OVER CHARGED because I was a woman or had a coupon. MY husband said he wasn't charge as much for his car which is the same brand car. There was no problem with doing my oil change. I was charged extra for a "special oil filter" wasn't told about, and " extra oil?" I wasn't told about?! EXTRA CHARGES! I can get my oil changed ANY PLACE. I want great customer service! Great overall experience. Everything easily explained to me and car throughly checked, which I loved. We were in and out in a half hour and my son loved that we got to stay in the car and watch! The staff was very friendly and knowledgeable. I am always glad that they tell me about any regular maintenance I may need, but do not pressure me to have it done. Quick service by a friendly staff can't be beaten. It's nice to be physically there while any kind of work is being done on my car. Helps me understand and appreciate the process. Everything was GREAT. There was no wait, I was treated fairly and because I made a mistake with my information, the gentleman worked with me and was very nice about it. I had a Great experience. i appreciate that the crew checks all my lights, wipe fluid, air pressure. They are fast and efficient and friendly. Everyone from the time we arrived until the time we left we polite and efficient. The serviceman that checked our oil explained that we needed other services, but he was not pushy, trying to convince us to get the other services. We really appreciated that. Quick and fast service. Same tech each time I go. Great customer service. Really quick, I didn’t need to wait for a long time. Mechanic knew what he is doing, was patient and explained everything what needs to be done by me in order to help him to check my vehicle. I was not told that the free car wash was not being automatically given with each visit. I had to ask for the voucher, and was told this was the last time I would receive it. Then he explained that you either get to use the email coupon or take the free car wash voucher. This would have been nice to know ahead of time. Also, it used to be customary that the service person would go over all of the recommended maintenance services for my vehicle each time I visit. They no longer do that. I would greatly appreciate them going over the recommended services so that I keep up on my preventative maintenance items each time. I believe doing these things each year has helped me keep my car running smoothly with over 140,000 miles. Everyone was friendly, communicated clearly to me and each other, and rgey were efficient. Excellent team. Very nice employees. Quick in and out change. Not pressured into buying anything. Understood that my car is a fixer upper and I didn’t want to put more money into it. Very clean and organized facility. I have always had a bad experience taking my car to Pep Boys. I dreaded having to have my oil changed because I never knew how long I’d be car-less while I waited for them to do 30 minutes worth of work. I’m so happy I found this place and I will be a returning customer for sure! Great service and amazing employees. I take all of our home and work vehicles here - thoroughly enjoy the experience. 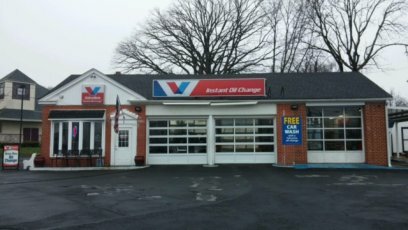 I took both my Wife's car and my daughter's car for the first time to Valvoline in Willow Grove, PA. Will, the man who greeted me and spent the time explaining everything was all about customer service (Something you don't see a lot of these days). He was a standout employee and should be recognized. Service from all staff was prompt and friendly. Very good experience overall. its a quick way to get an oil change. I felt like I was at a NASCAR pit stop once I entered the bay. My technician was extremely friendly and appears to like what he does for his company and customers. I had never been to a Valvoline before. I made an appointment with sears auto across the street but they didn’t have my appointment in the system. I needed an oil change because I was over due and Valvoline was right there. It was pretty cool that I didn’t even need to get out of my car. It took less than 15 minutes. If I went to Sears auto, I would have waited an hour. It was kind of a surprise that I could get my oil changed that quickly and not have to get out of the car. I am very satisfied with my experience. quick, efficient, staff was helpful and efficient. Outstanding service. Kieth, Craig & Tim did an outstanding job. My technician was super nice and personable! No pressure to buy additional stuff and even with a new battery installation on top of the oil change, I was in and out quick! I am always very satisfied with the personnel you employ and would highly recommend this business to everyone! Kim was super friendly and kept me entertained with her delightful conversation. Give her a raise, she’s awesome. The Assistant Manager and the technician were very friendly and knowledgeable about the service being performed. It was jus a fast & easy experience. Very nice. Honest service. First person to check my internal cabin air filter. Sent me a recap after that I may need a serpentine belt. I like that they provide the oil change as well as check over other areas for safety- lights, tires.Thank you! Their work is always consistent. Never had any issues with customer service or the work that is completed on my vehicle. Unlike when I have visited Jiffy Lube in the past, I didn't feel like I was being pressured to buy more stuff. I also appreciated being able to see (kind of) the mechanic working on my car's engine. Everyone was courteous and professional. I don't think I was there longer than 10-15 minutes, either. Nearly ideal! Staff was friendly- timely and knew what they were doing- had me back on the road in 20 minutes. The staff are always very nice and helpful. They have a great attitude and seem like they enjoy working there. It is a very pleasant experience! Kim and the team were very friendly and efficient. I was VERY disappointed to learn the free oil change after purchasing 6 has been discontinued. Kim explained it was a corporate decision as some unscrupulous people were abusing this perk. I think the tracking of oil changes could be maintained on computers and this could still be offered. I have been a customer at this Valvoline for many years. Fast, Very Friendly staff, never feel pressured to buy other services. Customer for many years. Always good service. Awesome service! Top notch staff! Keith is a great manager. Great customer service. Didn't try to sell me anything. Was straight forward. Everyone is very friendly, quick, professional. Showed me my air cleaner and said it looked good instead of trying to sell me on it looks dirty. Every time I go there they inspect my car well and tell me if I have any problems. The rep. was courteous,knowlegeable,and didn't pressure me. The technician was thorough and clear about what services were being done. It was fun and enjoyable to comunicate with with the service person as the work was being done. great customer service and the regimented way they approach the oil change really makes you feel like they didn't miss anything. Excellent work model I wont go anywhere else to get my oil changed. Great service. Knowledgeable service members. I hate dealing with car issues. The staff was very friendly and honest about the pricing and told me the things I should look to get worked on for my next visit. I did not feel like they were trying to pull a fast one. He gave me what I needed and did it quickly. Normally ,my oil changes takes up to five hours. He did it in least than 40 min. I am coming back for sure. All of the employees that I interacted with were very friendly and professional. I hate spending money on car things and waiting for my car to be fixed, but I don't mind coming here because the staff are always so nice and they do a great job. We go here often and since there are three bays, we never have to wait more then a few minutes. Also do not have to get out of the truck. And we always use the free car wash coupon they give us. Courteous, professional staff. I appreciated being informed about how they were servicing my vehicle. Very quick and efficient service throughout. Best customer service I could have asked for. Guys we’re great. Service was quick & the associates was friendly and knowledgeable. They made some suggestions one of which I thought was good for my vehicle so I purchased it. I was happy to get the instant coupon emailed to me when scheduling the appointment. Nice touch. It was a bit of a wait, but I had nothing else better to do, so I entertained myself with a few rounds of Candy Crush. Three attempts at the same level, and somewhere between 10-15 minutes, I got waived in. The technician that did greet and introduce himself when I did pull in the bay was really personable and polished. He made the wait totally worth it. If he’s not as honest and trustworthy as he seems, he’s a really good actor, and you should consider him for a role in your next ad campaign. I’m sure he’d settle for a well-earned raise though. Being able to sit in my vehicle watch them buzz around and listen to their cadence as they went about things was priceless. They deserve a show on Discovery Channel. Overall, Top Notch customer service...from the making the appointment to pulling out with fresh synthetic, these guys hit all my marks, and I’ll be bringing all my vehicles here...as well as recommend that others do as well. The staff was very helpful and knowledgeable with all the questions I asked. Everyone ws really friendly. The place was very clean and comfortable. I use this Valvoline for both of my cars. The service men and women that work there are always awesome! Employees were very pleasant and the services were very efficient. Very nice team and helpful! Would return for next oil change. Thoroughly walk around vehicle and talk about what needs to be done. Suggestions for future service. Service was fast and staff was friendly and everything done was explained to me. Staff was professional and friendly, team approach works nicely, nothing left unattended. Great job!!! I have got to tell you - I always get the best service at your place. The staff is knowledgeable, friendly and professional. Never pushy - just great customer service. My service was excellent as compared to my previous experience at Midas. They’re always nice and courteous. As a side note, the only reason I had to wait outside is because they weren’t open yet. The team is great! Service is excellent! Nothing compares! Will greeted me and was so friendly. He explained everything that he and the other technician did to my automobile. I will definitely return to your location for my oil changes and other work that can be completed at your facility. Everyone was very polite and energetic. Seems like they all work together well. I have never been to this service station before, and I really enjoyed that they allow you to stay in the car while they service (I was not expecting that) I liked how they explain everything to you and why they are doing it (and show you visuals i.e dirty filter). I know very little about cars so i found this to be very helpful for someone like me. I was charged a fee for a new drain plug because I was told that it was worn... which wouldn't be a problem, except I was told after the service was done and not shown the worn drain plug. I guess I could have asked to see it., which I didn't, but the service had already been done and it was a nominal fee for the service which is why I didn't ask. Just like a filter change, you should be shown the worn part and asked if you would like it to be replaced. Employees were absolutely great and very good at explaining everything they were doing. Quick and great customer care. Very fast service, and employees were very nice and knowledgeable. I like the fact that they show me the parts that Was replace and the clean oil stick after the oil was change. The best part of all was I didn't have to leave my car while work was being done. Service was good and didn't take long. great staff...friendly...professional....did a perfect job. it was quick and I felt the job was done right. I like their quick and knowledgeable service! Great customer service, fast oil change! Friendly and knowledgeable staff. Neat and clean shop. Very careful not to scratch my vehicle. The technician was very professional. The workers worked as a team. I was informed of future maintenance that my vehicle may need. QUICK, EASY, NO HASSLE! THE SERVICEMEN WERE PROFESSIONAL & POLITE! Everyone is VERY professional. As a Marine Corps veteran I like going to places the hire Veterans. I come here because it's fast and efficient. The staff is very polite and professional in there duties. I believe customer service is very important when you're in a business. That's why I returned to Valvoline. Thank You for your service. The employees were knowledgeable, polite, and professional. Staff explain what they do. They show you what they add what they fix. People are very nice very professional. It's a very good service . i just love ir. The service representative was very professional and friendly. All staff were very polished and courteous. I think my Technician's name was Will, if not mistaken. The service was fast, the workers were friendly & the price was good. The credit card machine was running slow but the workers found proactive way to move the process by starting the payment process a little earlier in the service process. The management team at the Willow Grove location is awesome. Good job by the attendants and speedy service.Plus,l'm thankful of been advised of futureservices on my vehicle. The staff is always pleasant and helpful. They are quick and efficient in their jobs and always make me feel like I'm getting the best deal for my money. They get you in and out, everything is very professional and the cost is reasonable. The knowledge and friendliness of the staff. I was in and out in about 25 mins total but I also had my tires rotated as well. Go there all the time and never have any problems. I waited a long time in my car; it’s really hot so was uncomfortable; my car is brand new so only needed oil change; seemed to take longer than necessary; would be nice if option to sit in waiting room was offered. Service was done quickly and service rep was knowledgeable. Every time I have visited this business the staff has always been extremely polite and knowledgeable. It is always a pleasure to come here! Staff was VERY nice & explained all questions. Didn't try to push extra costs. Great service and the entire staff was very helpful. Great job to your team. The staff members were very friendly and honest. I went and they changed my oil. There was no hassle and it was quick. Nothing to be upset about. It was quick and painless. The crew were extremely professional and took care of business. The servicemen were friendly and very informative. They seemed to value me as a customer. It was a quick visit and I was in a Texas me crunch so it worked out well. The staff was extremely friendly & knowledgeable. I was so impressed how they all work like a team to bring the best service to me. Also how they checked & showed me what they were doing. I knew I was getting what I paid for & more. The person completing my service seemed a bit unsure of the questions I asked, this is not the norm for my visits. When my husband isn’t free to do the “car stuff” I love that I am able to pull in and have my car serviced with very little wait time and the staff is courteous, professional and efficient. Quick easy and totally efficient!! The customer service was great and the oil change was quick. I like that I can sit in my car without takingMy kids out of their car seats. great service. Keith was not only extremely kind, but was very helpful! Employees very nice. Completed oil change very fast. Chris was SO polite and knowledgeable, I felt very well taken care of. He was training a new person (Will) and was patient and efficient when taking him through the steps. Overall amazing service!! The main reason I was highly satisfied was I didn’t feel pressured to buy anything at this visit. I can get it done at my leisure and that is how I like it. Too many "deals" and coupons out there without a set price for service available. I never in a million years thought I could ever visit a drive thru oil change. That was great. It was a short wait in my car but the service was well worth it. I sat in the car and pulled up a coupon for the service that I was getting. I’ll definitely be back. Customer service was very good. Service was performed in a quick but professional manner. Price and my engine light came on after I left. I have been getting my cars (3) serviced at your location for about 10 yrs. oil changes, tires rotated, filters, etc. they now tell us since we supply our own oil (Mobil 1) we no longer get a complementary car wash.
Because service is customer friendly and they are knowledgeable. They did checks on my car and I got to see them do it. Been using this business for over 20 yrs and always get the recommended service but because I used a coupon that was emailed to me by Valvoline I don't get a free wash. If I spend over $50 I should get a free wash. I can get an oil change and a car wash much cheaper than the conventional and pay for a basic wash at Shell. Thanks for showing me loyalty. NOT!!! It was like having your own pit crew. They took care of all maintenance areas of the car. Will was extremely knowledgeable and through with explaining the process with me. I felt like I understood more about my car. I had the manager work on my vehicle. I felt like I was in good hands, He informed me of improvements needed for my vehicle but didn’t pressure me to act. As a result I did make 1of2 recommendations and the next trip in I will do the other recommendation. It’s a pleasure to watch people who know what they are doing. It was obvious that the more experienced techs were supervising the newer ones. Great communication between techs as well as the client. I’m sure they service 1000’s of cars and to know how to reset my oil change light off the top of your head just shows the high level of competency. Kim was awesome. She explained everything clearly to me, didn’t pressure me to purchase additional items, but ended up anyway because it was best for me. Great service and friendly staff and all the work was done quickly, because I arrived at a good time and had several employees working on my car at once. Although I understand, I wished the service tech would have pushed me more to purchase the last filter. He said I could possibly go another oil change, but I just should have gotten it while I was there since I had all the others replaced. I know, most folk don't wnat to be hassled, but customer service was excellent and the conversation we had was appreciated-I would not have minded a lil nudge. Did not get a receipt. I went to get my oil changed on the 4th of July. I didn't expect the business to be opened. Your employees were very friendly, professional and courteous. My son took me down to the shop since he had used them before. I would definitely consider going there again. The manager was the one who completed my oil change. He did thank me for coming back. He was quick and explained everything he did. My technician was very pleasant and competent. He did not charge me for anything that wasn't necessary and was very honest. Very nice workers, quick service and professional attitude. I was very satisfied because I was greeted promptly and my car was in the bay in about 8 min. The technicians were all polite and friendly. They explain what they were doing and what other services I might need. There was no pressure to buy more services or products. Honest employees evaluated cabin and air filters. I just had a little bit of a wait - they had motioned for me to pull towards a specific service bay so I thought I was being seen right away, but then it was another 10 - 15 minutes before they told me to pull into a different one. Not a big deal, but I just save the best ratings for absolutely perfect service! They are fabulous with their customer service. I always feel welcome. They are quick and efficient. They offer you options without "pushing you" to get an extra service. They do a great job!! Very professional customer service, was in and out in under 10 minutes. Quick work once inside. It's always a positive experience. Glad that this convenient and affordable service exists. I'll be back! The gentleman that worked on my sisters car that day were fast, informative, and efficient! ALL of them. I even saw the lady working on another vehicle, interacting with the customer engaging in conversation, and she was so polite. I enjoyed having the car serviced there and I’ll be bringing my car back next time. I hate having my car serviced but this experience was the FIRST I enjoyed. I wish you guys were a full car service. I’d definitely be a forever customer. Thanks guys for not just explaining, but showing me what needed to be changed and why. As a woman not knowing much about cars, I’ve been played multiple times. The trust is definitely there. Thank you!! I always go to this Valvoline service location and the service is always Great!! Liked the quick service. Didn't have to leave my car. They were all friendly & explained to me everything they're going to do with my car. They did not try to sell me anything extra. 👍🏻 I feel safe driving my car to the NJ shore now! The customer service at the Willow Grove location was great. Everyone was so friendly and professional. I was in and out within 20 minutes. I will definitely be coming back for all my future oil changes! Everyone was very friendly. My only problem is that I presented a $10 coupon and only got a credit of $9?? Getting my oil changed without the wait is great. The service was fast and everyone was friendly. As soon as i drove up to the facility, the technician met me, and directed me into the shop. the service was very expedient, and took no more than 15 minutes to complete. I had to the Manager and he was simply great. A well run shop. He deserves a 10% raise. Very friendly. quick. love using the coupon. Excellent service as always. Will, Andrew,Chris and Rich did an outstanding job. I will only get my oil changed at Valvoline. It was my first time through the center. The tech was very professional and handled my truck professionally as I would expect. I like to be able to just pull up and sit in my car while the work is being done. Quick and easy. It was way faster than anticipated. I also appreciate how the mechanic kept me informed about what he was doing/checking. wish you would service Mini Coopers. Pulled up waited a few minutes pulled in and they started as soon as I did and was out in less than 15 minutes. ALL of the technicians were very personable and professional..Very happy with my service and I will happily recommend your business to friends! The group was extremely polite. They got me in and out on a Friday afternoon. I like the fact that you didn't have to leave the car. Very thorough, check everything and let me know the results right away. I've already recommend to my daughter and mother. Definitely would return again. The attendant was very nice and helpful. He did a superb job. Will was an excellent CSR. Not sure why it said Vernon on my CSR but the person I spoke to and served me had a shirt with a name tag of Will. Javon was also so kind and awesome! They made me laugh and talked to me like a human being and not a walking money bag. This is my second time and I now don't dread going to get my oil changed anymore! Thank you so much guys! They genuinely enjoy their job and don't try to push anything crazily and will tell you if somethings wrong but will not harass you over it. Perfect service! The wait was a bit long. The staff did take care of me quickly once I was able to pull into the bay. I liked the fact that I could change oil in my car during my lunch break at work. Instead of schedule it appointment someplace else and still wait for an oil change for another couple hours. I am a returning customer to THIS Valvoline location. I am ALWAYS extremely pleased with the level of professionalism, courtesy, and friendliness of the team. They handle me and my vehicle with the utmost care and concern. Every one introduces themselves, and are always mindful to explain everything! While, I realize Saturday's are busy, this was the 1st time I waited long. I was the 5th car in line that day. No other major problems or concerns! Valvoline has definitely changed things up, by allowing services to be performed while we wait WITH/INSIDE our vehicle! Thank You all very much! BLESSINGS!